This one goes out to all those unfortunate, uninitiated and uninspired individuals. Get off your high horse and read this. 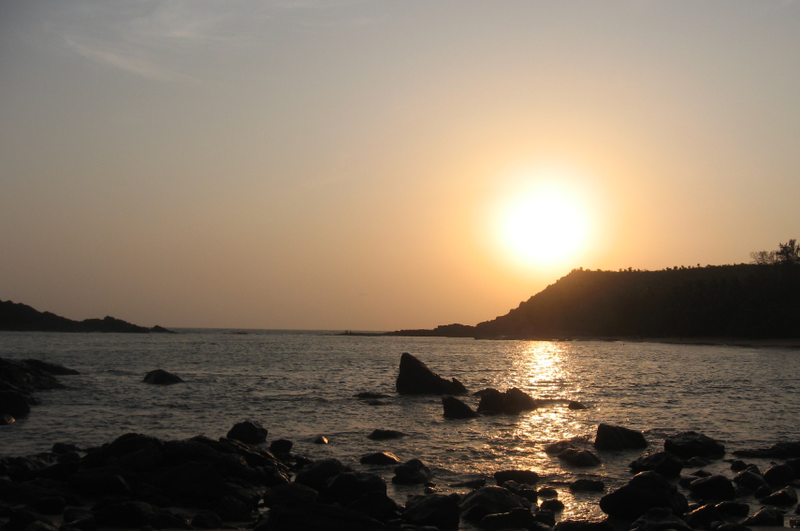 There may be a hundred reasons why a person goes to Gokarna. People looking to get laid, people looking to score and get high, people looking for a nice, secluded beach and people wanting to offer their prayers in India’s most sacred temple. I don’t know if there are any other reasons, and frankly, I don’t really care why people go there. I go there for a totally different reason, and its none of the above. I lead a difficult life. I need to balance my passion to work, my unceasing urge to travel and roam aimlessly across the country, my singularly fierce attraction to beaches and my bank account. Juggling these four volatile substances while playing air hockey with the family, the bosses, the peers, the juniors, the friends, the foes, the creditors, the goons, the loons, the whackadoodles, the geniuses, the crap, the stench and the slippery slopes of bankruptcy, unemployment and loneliness around every corner is taking its toll on my nerves. There are very few things I’m passionate about, and those that I am passionate about, I am so with a vehemence unseen in anyone else, for anything else. I do not go to Gokarna to ‘do drugs’. I do not go to Gokarna to ‘sleep with women’. I do not go to Gokarna to ‘drink drinks’. I do not go to Gokarna to visit the temple and offer my prayers. I do not go to Gokarna for the sea food. I do no go to Gokarna for the rustic beauty of the village. I do not go to Gokarna to ogle at half-naked women lounging in the sun. 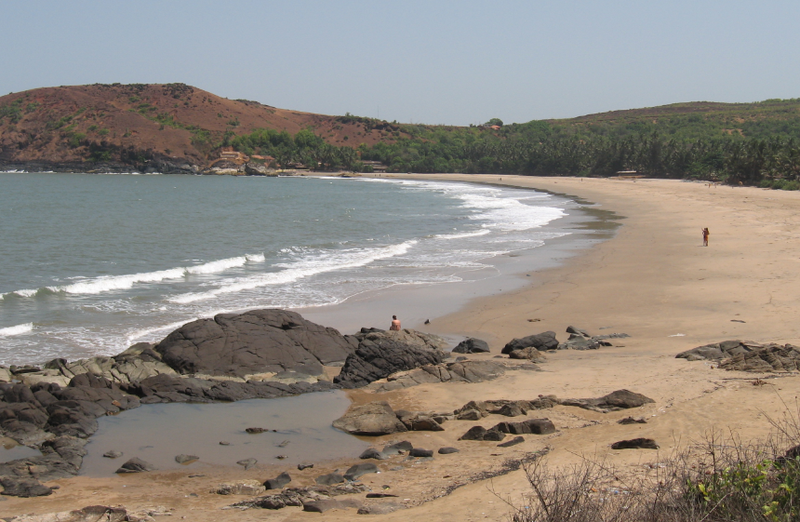 I do not go to Gokarna because I love beaches and water. I do not go to Gokarna to swim in the ocean. I do not go to Gokarna to live. I do not go to Gokarna to die. I go to Gokarna once every three months because I need to get away from the Greek tragedy that my life is fast unraveling to be; to clear my head of all thoughts – good and bad; to reboot myself. I go to Gokarna because its the only place on Earth that welcomes me without judging who I am or what I have done. I go to Gokarna because that is the only place on Earth where I am at peace. Completely. I have a sea rock, which I call my own, ten feet out into the ocean, at Om Beach. Its a bit of a hike to get to the top of the rock, and once I get there, I sit, looking at the waves crashing into me on all sides, rising twenty feet high and spraying me with a mist of cold, salty water. I listen to the rush, the gurgle, the power and the wordless songs of the waves and as I stare out into the horizon, imagining a place beyond comprehension, where the sky kisses the ocean, I realize that I am peaceful, within and without. Nothing of what is happening in life matters here. Time stands still for me, for the 48 hours I’m there. I put my feet up at a cafe, sipping sweet tea and reading a good book, or people watching on the burning, golden sands. I take a nice pleasant trek up to Kudle through thick brambles and open moors and I wade in the white sands until the sun starts to set. I walk back amidst the gathering darkness to Om Beach, walk all the way up to Half Moon and back again. As night descends around me, so does the peace, deeper inside me. I need this. I can’t do without it. For the unfortunate, uninitiated and uninspired individuals, I recommend it. The only thing I get high on, when in Gokarna, is Gokarna itself. We Indians have a peculiarly unique way of demanding justice. We stop eating and call a press conference. It all started with the great Mahatma Gandhi, who went on a hunger strike to oppose the tyranny of the British Raj, back in the 1930s and 1940s. This habit has not died after we got our independence. Every time the government does something that someone doesn’t approve of, a hunger strike is called along with a press conference. Recently, Anna Hazare did it to oppose corruption in the government. He was hailed as the present Mahatma and the press jumped to draw parallels with him and the original Mahatma. They called it the new Freedom Struggle. And more recently, a guy who made his living doing yoga, Baba Ramdev, went on a hunger strike and no one knows the reason why. I’m sure he gave a laundry list of reasons for doing what he did, but no one really understood them. It’s like an infectious disease here in India. If one person goes on a hunger strike, it spreads like a virus on heat and before you know it, your neighbor’s on a hunger strike against the local corporation office demanding better roads and clean water. It’s about time I joined in the fun. I am going on a hunger strike from today onwards to oppose hunger strikes all over. I will eat obscene amounts of food and go on a strike against hunger until everyone stops their respective hunger strikes and eradicates the country of this ridiculous disease. I vow to not go hungry again until my objective is fulfilled. This hunger strike will prove to the whole country that I am quite serious. I will not end this hunger strike until all hunger strikes have ended in this country. I am ready for my title now. I prefer something cool, and nothing with the word “Mahatma” in it. That’s become cliched. The scientists at the MirrorCracked Labs wish to thank all the esteemed readers who have carried this blog past the 50,000 hit milestone. Since it’s humble beginnings in March of this year, it has taken nine months to reach here, and every single person who’s read this blog is much appreciated. Being the brains behind this outfit, I have decided to dedicate this celebratory post to all of you. We, at the MC Labs decided to get drunk on Saturday night to celebrate this milestone, and in the stupor, made a few life-altering decisions. I was a bit confused. “I am?” I asked. So, that was it. I knew it would be a crazy session, and with the blog stats crossing the elusive milestone, I had a reason to celebrate. So, off I went, despite bad traffic, dirty roads, terrible heat and a reluctant bike. 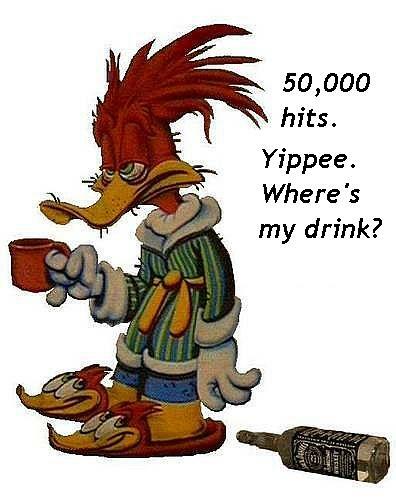 Slowly and steadily, I built up from a large shot of scotch to 4 large shots of scotch and 5 beers, and promptly crossed the borderline of being tipsy and being punch drunk. I started talking nonsense, screamed out the songs that the DJ was playing, swayed dangerously on the bike while driving and threw up thrice in a coffee shop.